Snow is my favorite type of Weather. I love the coldness and I adore taking my kiddos and pups outside to make snowmen and have snowball fights. My 2nd favorite type of weather is rain, to me there is nothing better then curling up under a warm blanket with a good book and listening to the rain pitter patter outside. I have 2 little boys though and being stuck inside and torture for them. And I wont fib me too!! It is hard to read when I have to get up every 2 minutes to fix something or help them do something. So I had to compromise my rainy days rituals now instead of curled up reading a good book we make a living room drive in movie area!! Yes it is as dorky as it sounds, we get out our sleeping bags, turn out the lights, grab our favorite snacks and curl up together to watch a movie. Now instead of rainy days being dreaded we all look forward to our movie day. So we all know the saying April Showers bring May Flowers, I feel like that saying was coined here in PA. We have had our fair share of rainy days!!! Lionsgate’s family adventure Norm of the North is heading to Digital HD March 29 and Blu-ray Combo Pack April 19! Follow the adventures of Norm, a polar bear from the Arctic who happens to have some very unusual talents and who has to head outside of his comfort zone to save his home! 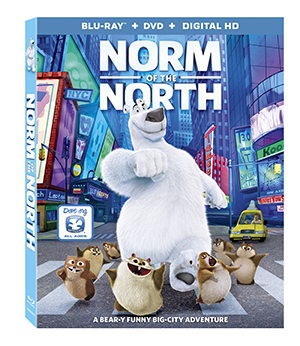 Norm embarks on a laugh-filled adventure in New York City with his lemming pals as they all try to stop greedy humans from turning the Arctic into a suburban neighborhood, and he makes some new friends along the way. This new movie is packed with laughs, music, fun characters and heart, Norm of the North is a must-own for the entire family! Bring home this heroic adventure on Digital HD March 29 and Blu-ray Combo Pack April 19! So the movie was okay..... My kiddos giggled, but I did notice that half way through the movie they started to lose interest. I feel like the plot was a bit lacking. The lemmings were def. the best part, they at least made us giggle several times! !